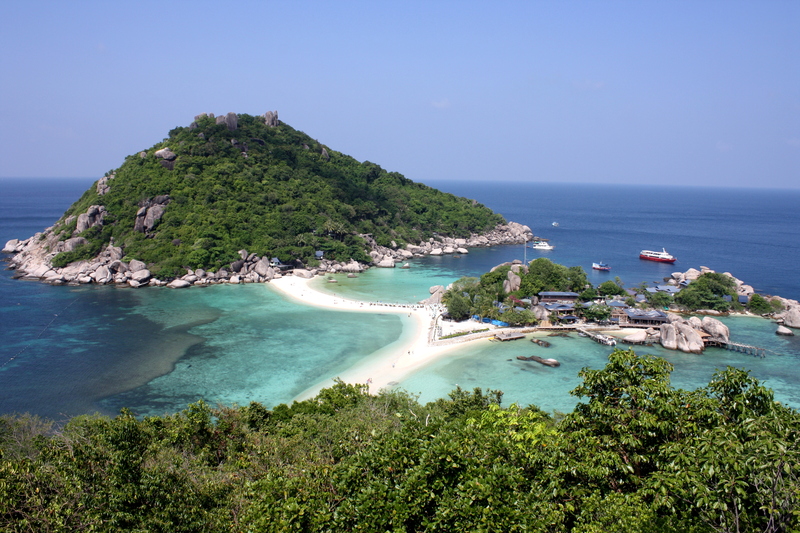 Ko Tao or “turtle island” is an island right off the coast of Chumphon in the Surat Thani Province in Southern Thailand. It is known for its beautifully clear water, which makes it a prime dive and snorkel destination. It is full of dive shops and avid scuba divers looking to see the wonderful world of underwater sealife. Despite my desire to see turtles, sharks and other colorful and large sea creatures, I am extremely frightened of being underwater, and being meters below sea level does not appeal to me. 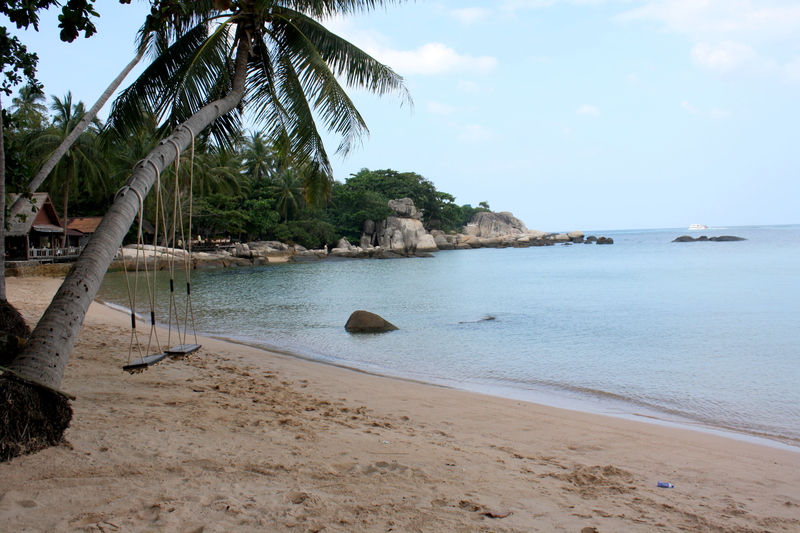 I arrived to Ko Tao early on in morning. Luckily, there is a boat leaving Lang Suan (the tiny town I live in about an hour south of Chumphon) to the island that only takes 2 hours and takes off around 7AM. Ferries and boats are also available in Chumphon and a night ferry is available from Surat Thani. When I arrived into the Mae Hat peir, I was quickly pestered by tuk tuk drivers and resort managers willing me to come with them to Sairee beach, the most popular and in turn the most crowded beach on the island. On the map to my right, I noticed a little dotted line leading to more secluded (and cheaper) places to stay. This was the path I chose to take. Five minutes later, I was pretty much climbing a mountain and forging myself through a very faded trail and overgrown brush. The one time I forget my shoes! My trip to Ko Tao was definitely a testiment to how trusty Rainbow Sandals can be. I had a huge smile across my face the entire time. I love hiking and I loved that there was a huge possibility I was lost. The trail was not easily marked and there were plenty of times when I had to make the executive decision on which way to go, left or right, up or down, through those trees or across the pile of boulders. I loved that I had no idea where I was going or where I was going to end up. I loved that I had no clue what I was looking for or what it was going to look like when I got there. To put it plainly, I loved it. I made it to a secluded beach covered in little bungalows called Sai Thong Resort. It was perfect! I checked in and was led to a little bungalow a ways up the hill. As soon as I saw the hammock I knew I was in heaven! I dropped my backpack and jumped into the hammock to relax after my hard trek through the wilderness. But I wasn’t done. There was way more forging ahead of me. 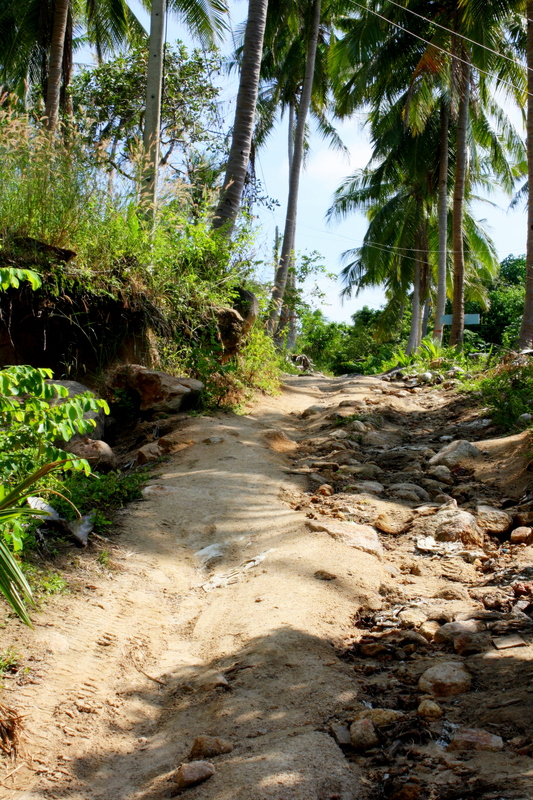 There was still a dotted line on the map that I hadn’t followed and I wanted to reach the next town, Chalok Baan Kao, that day so I could set up a snorkeling trip. So I set out again. This trail was much more difficult to follow and it included large boulders and steep inclines, but once again I found myself on a little secluded beach near the Sunset Bungalows and decided to take a dip in the crystal clear water. The ocean in Thailand is absolutely heavenly. It is the perfect refreshment from the hot sun. After an ample amount of time relaxing, I set out for the town. Lots of hiking later on what they call “roads” I reached a place called Viewpoint resort and stopped to have lunch. My table was located right on the rocks with the perfect view of the beautiful Chalok Baan Kao Bay. This is supposed to be a road?! After an amazing lunch of sweet and sour chicken, I headed into the town to find a place to set up a snorkeling trip. I found a shop and put down the money to buy the trip. He asked me where I was staying and much to my dismay my bungalows were too far for them to pick me up in the morning! I had to do the hike again early in the morning!! This didn’t discourage me one bit. 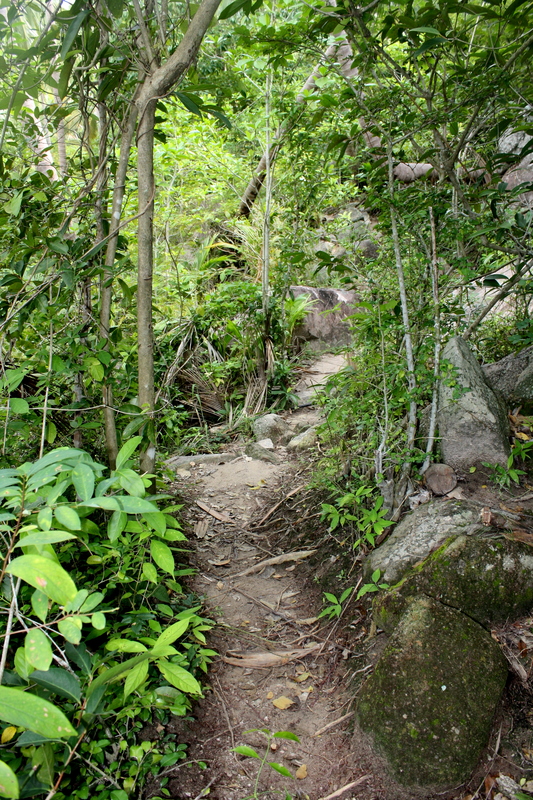 I enjoyed the hike and because I haven’t worked out too much in Thailand, I took it as a wonderful challenge. The next morning I woke up around 7 and made my way into town. The hike was rough and difficult, especially in the morning, but it was a good rough and difficult. I truly enjoyed it and once again had a smile plastered across my face. Apparently, I was forgotten because I waited for about an hour at the booking agency and then was rushed to the boat with everyone starting at me like I was the late one. And by rushed, I mean I had to jump aboard a motorcycle taxi, and a motorcycle taxi on the mountainous Ko Tao, is an adventure I wasn’t ready for. But, as always, I survived, and made it to the boat, with another crazy adventure under my belt. I spotted a Rainbow Fish! The day of snorkeling was exhausting, but completely worth it. At the first stop, Shark Island, I learned about “sea lice.” According to a website on staying safe at the beach, “Sea lice are actually the microscopic larvae of jellyfish and other ocean stingers which contain the same nematocysts (stinging cells) as mommy and daddy.” I felt like my body was on fire! The first sting was surprising. I literally said out loud, “What in the world was that! !” Then as I decided to follow the path of some big fish, I must have swam into a swarm of them, because I felt them on every inch of my body! 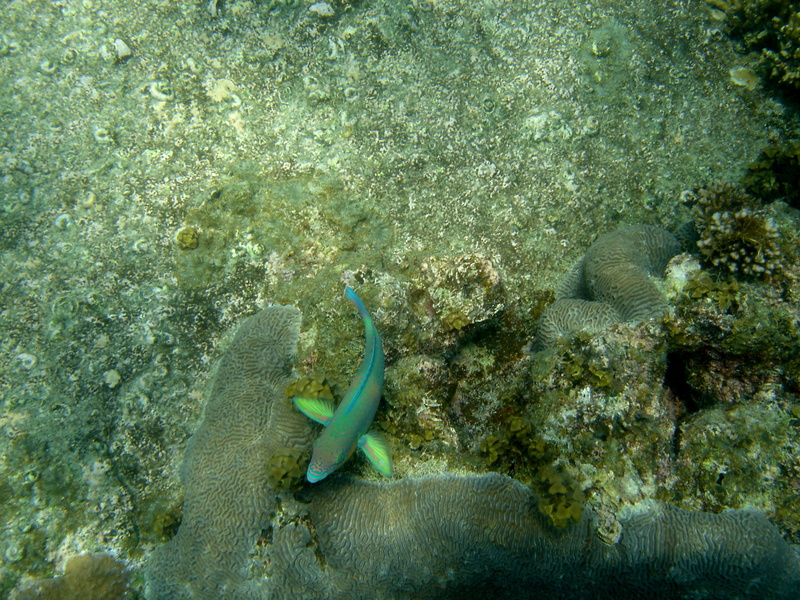 The snorkeling was amazing there, huge fish, beautiful coral, but I had to get out of the water as soon as I could! The rest of the day was magnificent! We circled the entire island and ended up on the little island off the coast called Ko Nang Yuan. With two hours to kill on the small island, I quickly climbed the hundreds of stairs to a breathtaking lookout, knowing that I would soon be swimming in the crystal blue water and relaxing in the white sand. What an amazing sight. I would have loved to see the island when it was empty and uninhabited, but then again I probably wouldn’t be standing there if it was deserted. 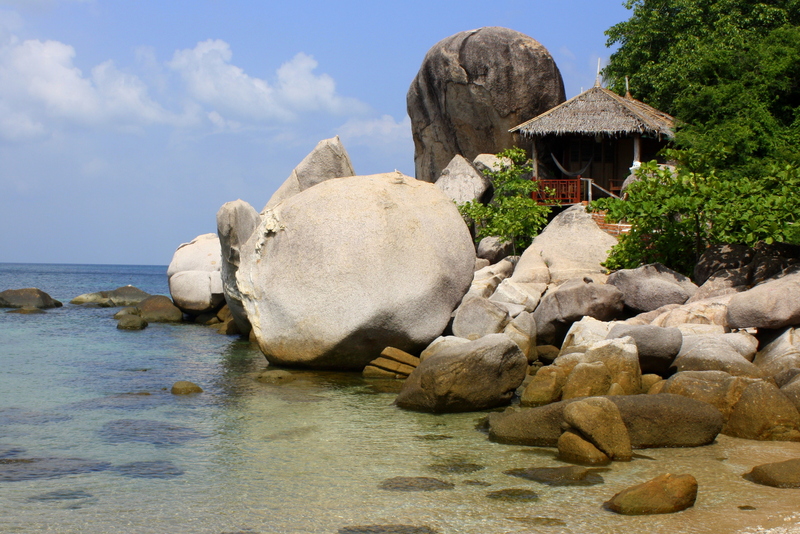 Ko Tao is has so much to offer. Dive excursions and snorkeling trips are incredibly easy to find. The sun is strong and the beaches are beautiful. It is the perfect stop for adventurous travelers! I will be going back soon! !